The Mazza Museum of International Art from Picture Books was established by Dr. Jerry Mallet in 1982 to promote literacy and enrich the lives of all people through the art of picture book illustration. Located at the University of Findlay in Ohio, the museum is home to the world’s first and most diverse collection of original art from picture books. The Mazza Museum provides more than 47 programs annually for people of all ages. This exhibition features 29 illustrations, spanning the 1950s to the present, from the museum’s collection relating to science, engineering, and medicine. Illustrators featured include Lynne Avril, Robin Brickman, Christopher Canyon, and D.C. area-based artist Patrick O'Brien. In an era of software and computer screens, the exhibit transports us back to the place where we first learned to dream: inside the pages of our favorite picture books. Jay Labov, senior adviser for education and medicine at the National Academies of Sciences, Engineering, and Medicine, visited the Mazza Museum and brought the collection to the attention of CPNAS. Labov stated, "The National Academies published a report called STEM (Science, Technology, Engineering, and Mathematics) Learning is Everywhere. While touring the Mazza Museum, I realized that much of the artwork exhibited there has enthralled so many generations of children and it teaches invaluable insights and understanding about the world of science and engineering. I was eager to bring this gem of a museum to the attention of the director of the Cultural Programs of the National Academy of Sciences and am thrilled that children and adults alike in the Washington area will be able to partake of same of that museum's vast collection." Copies of the books in which the artwork is reproduced are available for reading in the gallery. 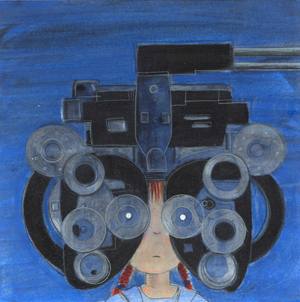 Image: Lynne Avril, The Pirate of Kindergarten, Page 34, 2010, colored pencil and watercolor.